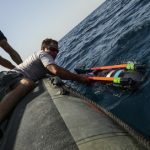 U.S. Navy sailors onboard the USS Sentry mine-countermeasures ship destroyed a training mine with live explosives attached to an unmanned underwater vehicle during an exercise conducted April 14. The Navy said Monday that the sailors piloted the SLQ-60 SeaFox UUV to probe and neutralize mine-like objects with the use of the SQQ-32 mine hunting sonar as part of the International Mine Countermeasures exercise more than 30 countries participated in. Sailors use C-round, an explosive variant of SeaFox, to destroy the sensory data collection chamber that would have armed the MK36 influence mine. SeaFox is built to incorporate sonar, cameras, fiber optics and searchlights designed to help gather visual information of the ocean floor and pinpoint the mines. Scheduled to end Tuesday, the IMCMEX features scenarios such as mine countermeasures, infrastructure protection and maritime security missions.